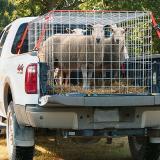 Collapsible welded wire livestock hauler for transporting sheep, goats, and guard dogs in the back of a pickup. Designed to fit inside the truck wheel wells while allowing the tailgate to close. Always secure hauler with tie downs—which are not included. 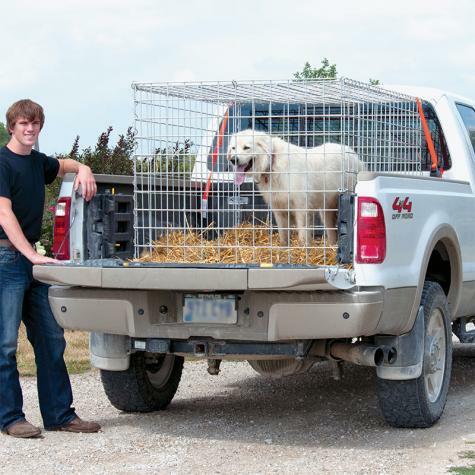 Unlike conventional pickup livestock transports, welded wire panel carriers are easily disassembled and stored. PowerBilt® panels: (2) 36"x36" and (3) 36"x60"
Wire panel connector hinges: 8-36"
Standard panels: (2) 40"x48" and (2) 40"x72"
Wire panel connector hinges: (4) 36", (3) 40" and (2) 48"
*Items #967000 and #967001 are subject to shipping charges due to oversized and/or overweight items. Use the following table as a general estimate. Exact shipping charges may vary based on your location. We will contact you via phone or email with a quote before the product is shipped. These haulers should be assembled in the back of a pickup. I would not recommend this product for transport. Product is too loose and wants to separate causing tie downs to loosen. I since have purchase a product from EBY to use on my landscape trailer. 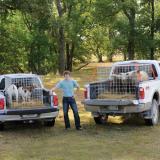 I will use the Premier product for a stand alone quarantine cage for sick animals or goat fencing. Great company with great support. It got here quick and was very easy to put together. Fit into our pickup perfectly and was easy to tie down. 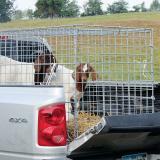 We picked up 3 young goats and had no problems. Large Hauler looks and works as described. Fast shipping. The bedliner in my truck made the fit tight, but it still fit. 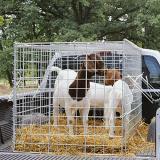 I transported a couple of goats to a fair using the hauler (4 hr drive) and it worked great. The galvanized coating and heavy duty construction should make this last a lifetime. I am very happy with the small pick-up hauler I ordered. It is a high quality product, and I am very impressed. It also arrived on time.